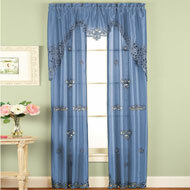 Christine Floral Curtain Panel Pairs from Collections Etc. 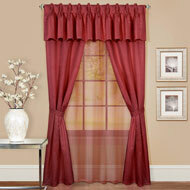 Cover your windows with this beautiful panel pair. 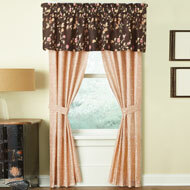 Featuring a lovely floral pattern of red, blue, green and beige atop a cream colored background, it has bronze grommets, straight sides and bottom hems. Machine wash. Polyester and linen; imported. 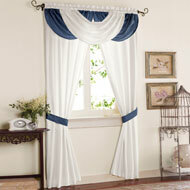 Each measures 38"W x 84"L. (Matching valance #A2106 sold separately.) This item ships from a separate warehouse and will arrive in a separate package.